4. OR cross the street and use the unobstructed sidewalk on the west side of Clifton! A. There is NO pedestrian (or vehicular) access to Target (which occupies the entire block), nor anything else, on the east side of Clifton. B. The first photo shows clear pedestrian access in front of the bins, the second photo shows the bins pulled forward, to the curb, for better access, for both people dropping off and for trucks picking up. Unless someone has gone to the effort to remove the full width of concrete visible in the first photo, pedestrian access is still available behind the bins – they don’t take up the entire width of the concrete paving, never have, never will. I get it. You don’t want ANYTHING blocking your precious sidewalks. It doesn’t look like you were even trying to walk, here, just doing a drive-by, to find something else to complain, oops, post, about. I’m very familiar with this area. This NOT an issue with the local residents – if it were, the aldermen would’ve been all over it, in a heartbeat. When I first encountered the problem it was because I wanted to catch a bus, I don’t recall exactly why I was on the back side of Target. The beauty of a fully connected street grid is knowing it cab be used to access the rest of the grid. I got almost to Chippewa before I realized the sidewalk was entirely blocked — the first photo is when the asphalt had been removed to resurface. It is 100% blocked — an able-bodied person would need to step into the street or onto the grass. It’s unacceptable. Just put them in the street and tell motorists not to run into them! . I imagine Steve would complain that the rope used to hang himself was too long. The sidewalk is built for pedestrians and there is plenty of street space. Why would you advocate blocking the sidewalk when it’s clearly not necessary? Also, how do you know it’s not a hassle to the local people unless you stand by and monitor this location 24/7/365? He defends the status quo at every opportunity, thinks it is ok to inconvenience pedestrians. Why are these even necessary given the city provides alley bins (which anyone can put recycling into)? Not every part of the city collects recycling in the alleys. In some wards they have these collection points instead. Really, why? What are the drawbacks to convenient collection outside your back door? Some less considerate neighbors put regular trash in the recycling bins, which puts the entire load at risk of being thrown away. 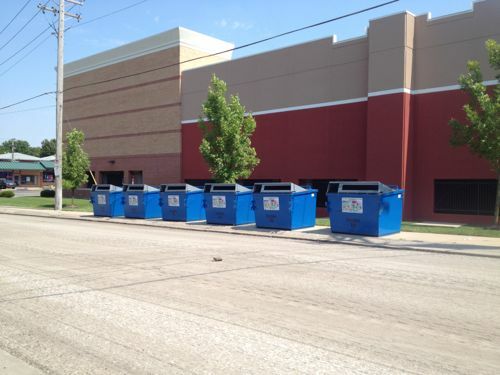 I still bring my recycling to the main collection sites to reduce that risk. But what is said idiot neighbor decides to put rubbish in that bin? I don’t follow the logic here. With more people recycling, there’s actually less net demand for everything being recycled, so it ends up costing cities MORE to recycle than to just haul everything to the landfill. The other part of the equation is creating and supporting the market for recycled materials. My personal choice is trying to buy my beverages (beer!) in aluminum containers, instead of glass, since glass is harder to recycle. Can’t say I mind paying to see my recyclables recycled. No, no, it doesn’t. Landfilling costs are super expensive these days. The cities do have to pay to have the recyclables taken away for recycling, but in most of the country they pay *less* than they would pay to get them into landfills. I’ve gone through this for multiple municipalities. Cato’s not a trustworthy source; they lie. Basically there are not that many landfills, nobody wants a new landfill opened in their back yard, and the cost of managing a landfill is very high and rising (controlling methane emissions, preventing toxics from getting out, all kinds of expenses), so the landfill operators are charging more and more. This is why cities save money by recycling. I’d talk to the manager of the Target, armed with the citations showing that blocking the public sidewalk is illegal. 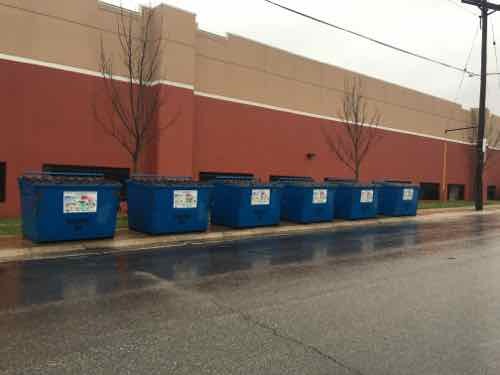 They might not be Target’s, but they probably are, so I’d first ask whether the dumpsters actually belong to Target. If not, the question is whose they are. Something you wrote indicates that this may be some kind of municipal program? In that case, whoever’s in charge of that municipal program is the one who needs a stern talking-to.